Explore The Possibilities Within Hospitality! When it comes to working in the hospitality industry, the options are truly endless. Whether you wish to work in customer service, aspire to be in a management role, or have an interest in tourism, hospitality training can help you reach your goals! The following are the top 5 jobs in the hospitality industry. Discover how hospitality training at Career Technical Institute can help you excel in your new career! The Head of Housekeeping does not spend their time cleaning. They manage the housekeepers and ensure everything is running smoothly. The Head of Housekeeping communicates with the Hotel Manager, Architects, Construction Contractors, and even the Guest Relations staff to have housekeepers staffed as needed. If you dream of traveling around the world and getting paid for it, hospitality is the field for you. Whether you choose to go by air or sea, you will get the experience to see the world as a flight crew attendant or a cruise ship worker. Destinations are constantly changing, and you may be put on new routes when the need arises. These professionals are responsible for the satisfaction of the customer. The skills you learn in hospitality training will help to make the trip one they will always remember. A sommelier is a perfect job for the wine connoisseur. A sommelier is a wine steward that works in a variety of settings. Sommeliers help guests find the perfect pairing of wine so they can have a world-class dining experience. However, if you prefer to work with the meals instead, you may be more interested in becoming a regional chef. Regional chefs often go through hospitality training before they start their careers! Whether people are in town visiting family or are on a business trip, hotels are a substantial part of the hospitality industry. Most large towns and cities have dozens, if not hundreds, of hotels to choose from. 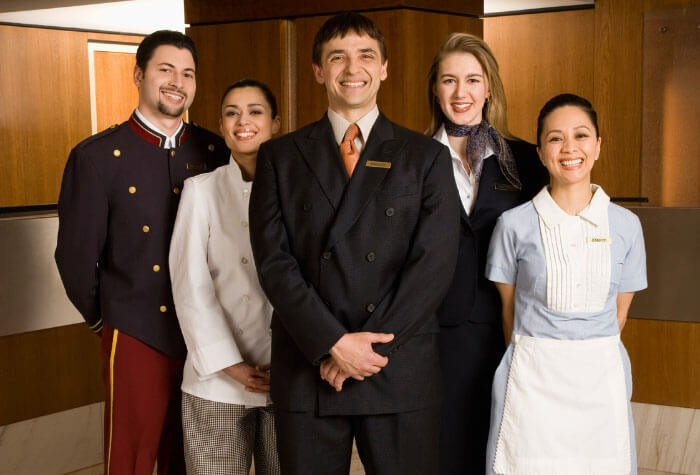 Hotels require a management staff to keep the day-to-day operations run smoothly. It is also the responsibility of the hotel manager to ensure guests are pleased with their stay. Those working in the food and beverage industry often possess a strong customer service background. Making sure each guest is having a positive experience is vital in this line of work. Part of providing a positive experience is keeping a watchful eye on the logistics behind the scenes. This includes assuring that there is enough food/beverage for each event and that arrangements have been made for guests with special dietary needs or restriction have their needs met. Eventually, working in the industry long enough can lead to management positions. When you get a degree in hospitality, you open the door the new career opportunities. Whether you love providing quality customer service, hope to be in a management role, or want to travel the world, there are options to fit your needs. For more information about a career in hospitality, please feel free to contact us at Career Technical Institute! We’ll help you get enrolled and answer any questions you may have.